Pharmacists are integral members of the healthcare team. 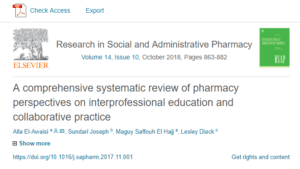 In a recent systematic review, authors summarized the literature on pharmacy students, pharmacy faculty and practising pharmacists toward interprofessional education and collaborative practice. The conclusion is that sustained efforts are still required to improve undergraduate curricula and promote interprofessional culture at individual and organisational levels.